It seems that a second big expansion for the Forza Horizon 3 video game for XBox One and PC is set to drop May 9th, bringing with it a slew of new Hot Wheels-based models for players to drive, including 2014’s Hot Wheels Ford Mustang from Action Vehicle Engineering. 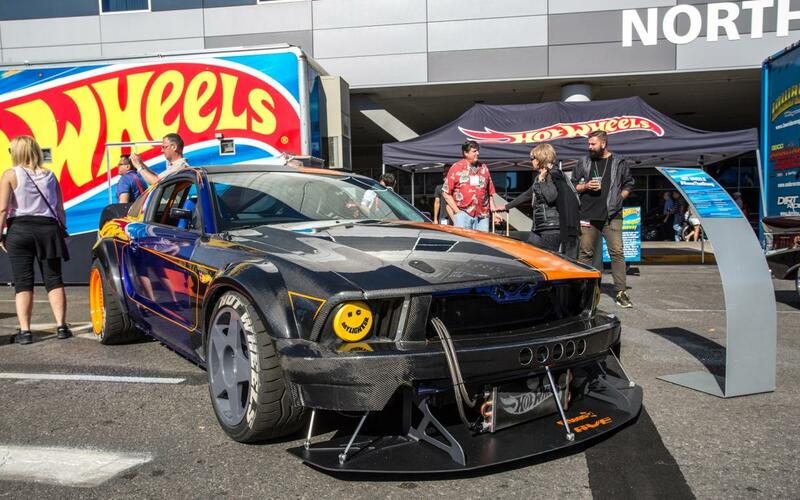 Yes; in case you’d forgotten, this utterly unique Hot Wheels Mustang was actually built as a life-size custom vehicle for the 2014 SEMA Show in Las Vegas. It was actually based on a 2005 model-year vehicle, although by the time Action Vehicle Engineering got done with it, one could hardly tell. The 2005 Hot Wheels Mustang was envisioned as sort of an homage to a Japanese-style race car, and simultaneously, as a means of commemorating 50 years of Ford’s iconic pony car. It rocks huge fender flares, carbon-fiber accents, an adjustable chin spoiler the size of Alaska, an aggressive rear diffuser, and an oil cooler that sits right out in the open underneath the front bumper, the feed and return lines running right through the empty cavity once occupied by the grille. Now, fans of Forza Horizon 3 will actually be able to drive this imaginative machine – virtually, at least. The new FH3 expansion will feature plenty of other content besides, including another eight wild vehicle models, and six new themed islands to play on, which are reachable in the game only via Hot Wheels tracks. A press release promises such delectable treats as “loops, corkscrews… boost pads, high-bank turns, half-pipes, insane jumps, and even giant mechanical dinosaurs.” If that all sounds good, just wait until you see what it looks like, in the video above. The Hot Wheels expansion for Forza Horizon 3 will be available May 9th as a $19.99 standalone purchase, or a free download with the Expansion Pass.